Family Escape Plan - What You Need to Know! Having a family escape plan is a crucial part of your family’s survival during emergency situations. All the preps in the world won’t mean a thing if you’re not alive to use them. When we think of escape plans, the first thing that comes to mind is escaping from fires. There’s several emergency situations that will call for a quick evacuation of your home or dwelling. Some of these situations are of course a house fire, tornado or other weather related crisis, and even a home intruder or burglar. It only takes a couple of minutes to sketch out a family escape plan , and with a couple of test runs, you and your loved ones are sure to make it out successfully. Getting started on your family escape plan is as simple as drawing on a sheet of paper. First, walk through your house or dwelling and look for all exit points and escape routes. If possible, try to locate 2 exits paths from each room. The most likely exits will be both windows and doors. Once the escape routes are figured out, simply draw out the layout of your home on a sheet of paper. Clearly label each room and draw arrows showing the emergency exits from each of them. Extend the arrows from each room all the way through the home and out to a designated and safe meeting place in the yard. By having a designated meeting place, you’ll be able to quickly identify if there’s any loved ones still inside or in trouble. It’s a good idea to use 2 different color markers, one for each escape path. One color for the first and best option of escape and another for the backup escape route if there is one. 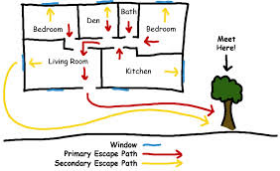 Example of a family escape plan with a designated meeting place. * Make sure that everyone in your family views and memorizes all the exit ways out of the house. * Make sure that all the doors and windows that you’ve designated as exits are in good working condition and free of clutter or blockages. * If you’ve prepared a bugout bag, or B.O.B., make sure that it’s easily accessible to grab along one of the exit paths. * If you have a family member that’s in need of assistance like a newborn, elderly person, or disabled person, make sure that someone is assigned to assist them in their exit of the home. * When you have company that’s staying over for the night, it’s a good idea to share your family escape plan with them just in case you find yourself in an emergency situation while they’re in your home. * It’s also a good idea to memorize the phone numbers of important contacts. This way someone can get to the meeting place or even next door if need be and call for appropriate help. * Once you make it out of the dwelling, stay out until everyone has been accounted for and the property has been cleared for reentry. * Practice your escape drill! Walking through your family escape plan several times a year will keep the whole process fresh in everyone’s mind. You want this plan to be second nature and done without hesitation. We never know how or when the next emergency will come, so it’s best to prepare for any situation that we find ourselves in. Having a family escape plan is just another way to increase the chance of survival of your loved ones in times of crisis.